Consul is an e-government and e-participation digital platform software originally developed for the Madrid City government. The main principles on which the platform is based are: open participation, transparency, the combination of online and offline participation, and citizen empowerment. The platform helps to manage the complexity of participation, which is often a challenging task for councils. The platform brings government closer to the citizenry by opening up direct participatory channels for policy making. Consul allows citizens to be an active part of the city government by offering them different kinds of participatory mechanisms for direct democracy, deliberation and other collaborative political practices. Consul allows users to launch collective debates, to propose and support proposals, to organise physical meetings, to run citizen surveys, to organise votes on how investment should be distributed, or to write laws in a collaborative way. In summary, a key value has been to integrate several functionalities into the same digital participatory platform. It is one of the tools related to collaborative policy making from the D-CENT Toolbox (Decentralised Citizens ENgagement Technologies). Its objective is to enable citizens to participate in the policy making process using collaborative online platforms. The application backend is written in the Ruby language using the Ruby on Rails framework and it is freely distributed under an Affero GPL v3 license. Start debates: the platform provides an open space for sharing and discussing the things that matter to citizens. Open proposals: it allows citizens to submit proposals related to the kind of city that they want to live in. Make collaborative decisions: citizens can vote on whether to accept or reject the most supported proposals. If a proposal is accepted by the majority, the City Council accepts it as its own and makes it happen. 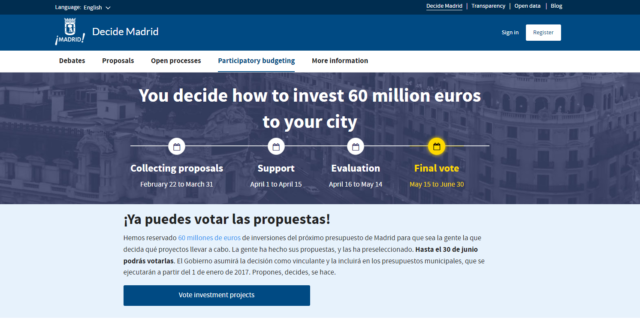 Participate in budgets: it enables citizens vote to decide how to distribute investment across the city and the districts. 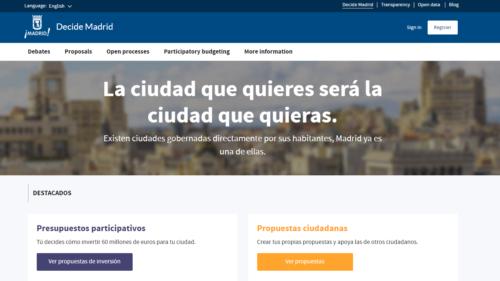 Decide Madrid: The Ahora Madrid coalition launched its Decide Madrid platform after the recent municipal elections in order to enable citizens to propose, debate, prioritise and implement policy for the city. 2. 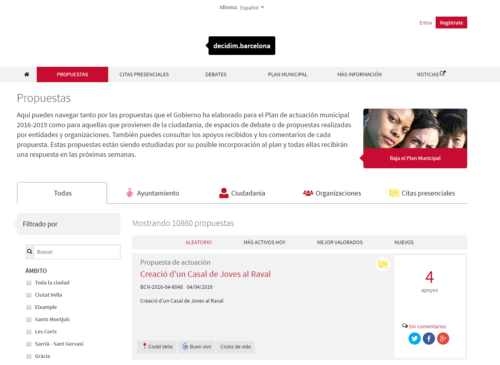 Decidim Barcelona: The City of Barcelona launched its participation platform in February 2016. The aim of the tool is to build a democratic, open and transparent government by enhancing citizen participation in the definition and development of policies. Since its launch, it has received 10,945 proposals and 18,680 comments from 24,000 registered users, and has facilitated 480 physical meetings for 10,800 attendees.